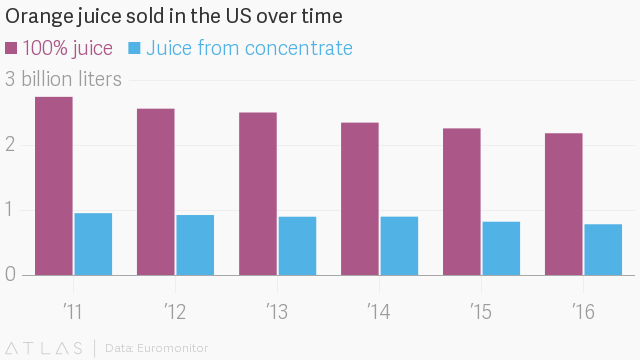 Americans began falling out of love with orange juice a long time ago, and as consumer taste changes the landscape of breakfast tables across many Western countries, O.J. has continued to cede ground to other products. Some attribute the change to the fact that many consumers have grown leery of the high sugar content in juice products or have simply embraced a breakfast-on-the-go mentality that has them buying up more convenient breakfast bars and yogurts. Yogurt has carved out a larger spot on the breakfast table, and major cereal companies are coming up with a plethora of new products that never have to pair with milk. 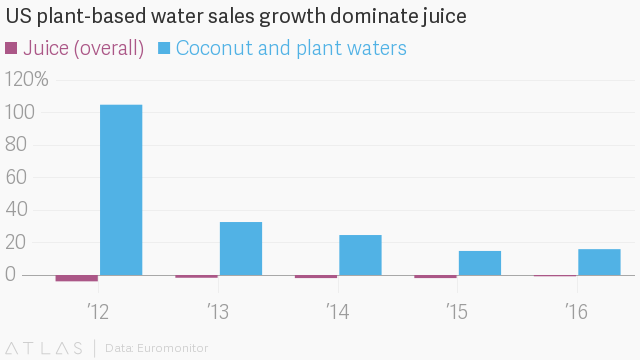 Most of the squeeze is coming from consumers who’re turning to other options, including smoothies and coconut water—which helps explain why PepsiCo, the parent company of Tropicana juice company, has reportedly been in talks to acquire All Market, the owner of fast-growing coconut-water company Vita Coco. This change in consumer taste poses a tough problem for one South American economy, in particular. About half of all orange juice in the world is from Brazil, but with a 5% decline in consumption worldwide, citrus growers there are staring down a major shift in a significant sector of the country’s economy. In 2014, Brazil produced 400 million boxes of oranges, a number that tumbled to just 242 million boxes last year, according to the BBC. To alleviate that pressure, Brazil is looking to grow more interest in orange juice elsewhere—and it need look no further than its own backyard. More than 95% of oranges grown in Brazil are shipped abroad, most of it in the form of orange juice. If it could keep some of that domestic, growers would be less reliant on other countries and more able to weather market fluctuations in exchange rates and commodity prices. That’s a situation the massive Brazilian meat industry already enjoys. It can almost always turn to the domestic market to support its industry when troubles arise abroad; 80% of Brazilian meat is consumed in the country. 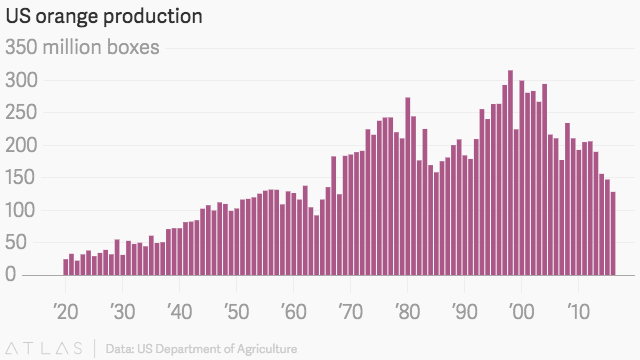 To be sure, Brazil isn’t the only country with a struggling citrus market. In the US, Florida growers have been tussling for years with a pernicious pest problem, known broadly as “citrus greening.” The infestation has contributed to a significant reduction in the number of oranges the country produces annually. That hit to the US market actually wound up being a boon for the very Brazilian growers who are now troubled by waning consumer interest. New evidence show Florida is beginning to recover some of its citrus crops after the long battle against citrus greening, whether consumers will be there to buy the juice, though, remains to be seen.